You will need to pay for your log cabin prior to, or on, delivery. Our account details are on the Order Confirmation and invoice which you will be sent in the post. 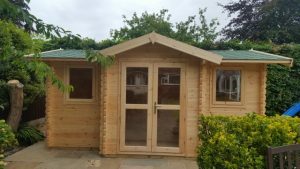 Cash can be given to the delivery team during the delivery of garden log cabins. Bank/Building Society cheques made payable to GEM Partners Ltd (no personal cheques sorry) must be sent in advance so we can pay them in and have cleared funds before delivery.